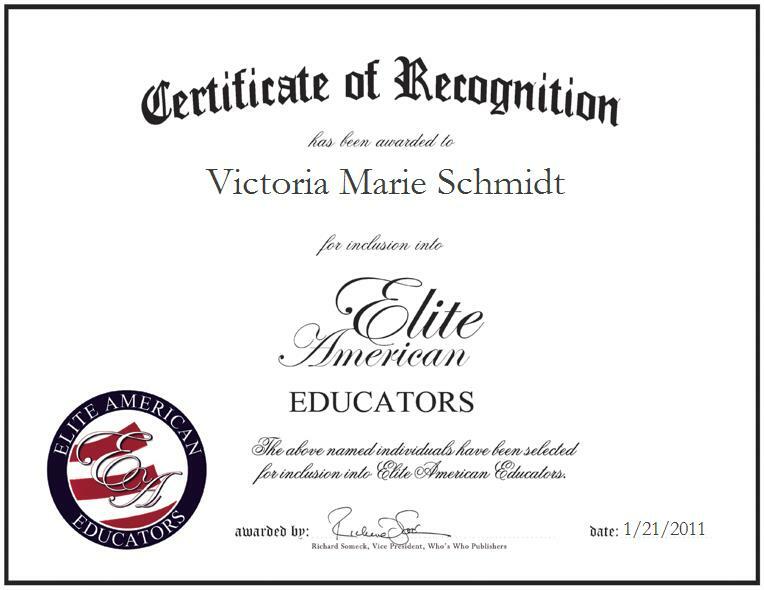 Pleasanton, California, January 21, 2011, Victoria Schmidt, Music Specialist and Choral Director of the Hayward Unified School District, has been recognized by Elite American Educators for dedication, achievements, and leadership in music instruction. At the age of eight, Victoria Schmidt joined her church choir and unmasked the passion that would lay the foundation for a gratifying and successful career. For 23 years, she has served as a music specialist and choral director for the Hayward Unified School District, where she infuses music education to children ranging from first grade to eighth grade. Basing her curriculum off of the Kodaly Method, Ms. Schmidt is able to introduce musical skills in accordance with students’ brain development. For first- through fourth-grade students, she starts with basic concepts and builds their capabilities before teaching more advanced techniques. Likewise, Ms. Schmidt spearheads the fifth- and sixth-grade chorus at Eden Gardens Elementary School, and the 103 member concert-choir at Anthony W. Ochoa Middle School. Ms. Schmidt received a Master of Music Education, with a concentration in Kodaly methodology, from Holy Names University in Oakland, California. She also holds a Bachelor of Music in Piano Pedagogy from the same institution. Retaining a single subject teaching credential in music, Ms. Schmidt earned a CLAD equivalent teaching certification in 2008. In addition, she has been awarded as educator of the year on two occasions by CMEA Bay Section, and the Hayward Unified School District. To keep abreast of industry changes, Ms. Schmidt is affiliated with the Northern California Association of Kodaly Educators, the Organization of American Kodaly Educators, the American Choral Directors Association, and the National Association for Music Education.